When it comes to the season’s best outerwear, it is clear that bigger is better. Just like the plethora of plaids, acid wash denim and crop tops that made their way back into our closets for spring, it is apparent that another 90’s trend is back on the scene. However, to make the trend more modern designers played around with the latest textures, explored the color wheel and also created confections that are much more structured than their predecessors. Luckily, I was also able to get in on the oversized outerwear action when I found this Mango piece. Not only is the pattern clever, but the mere heaviness of the fabric allows the coat to be “larger than life”, without being bulky and unflattering at the same time. And it is this clean silhouette and structured material that makes the trend work so well today. Love this! Loving turtlenecks right now..the whole look is so clean and chic..love! The chic coat with those leather jeans make for a fabulously chic, streetstyle look! saw that coat a little while back and swooned over it……glad you own because its so you, so chic! Absolutely loving over-sized coats lately- I’ve bought 3 this season. Loving this outfit! That is such a great coat! That blazer is gorgeous, amazing find! These leather pants are gorgeous!!! Pretty women! This is a great look! I love the leather pants! I’m getting a little obsessed with turtlenecks at the moment, and now you’re making me want one even more! Love the detail on those jeans too! Glorious! I love the pattern on the coat and how it’s more of a lighter plaid than overpowered by the darker colors. Very nice! Amazing post! Really like the coat and photos dear! Love the title!!! Great look … your oversized plaid coat is amazing!!!!! In love with your coat, so beautiful!! This is a fabulous coat and I love that you paired it with those sleek skinnies and those pointed heels! This is also a statement jacket that would be rad with some laid back jeans. 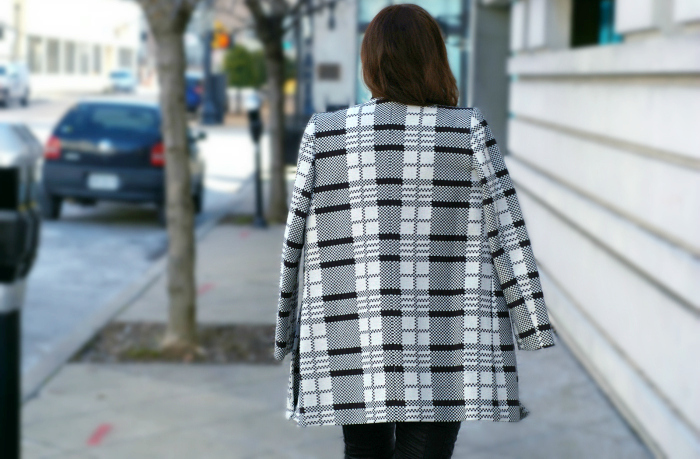 Love the print of this coat, it’s a great revamp of a houndstooth style. You look great. You look amazing!! That coat is perfection!! !